What are the overall dimensions of the binder, 5.5&quot; x 8.5&quot; or 8.5&quot; x 11&quot; or 3.75&quot; x 6.75&quot; &nbsp;? 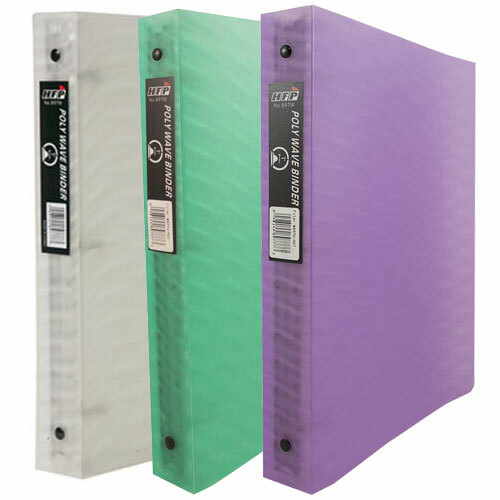 These binders measure 9 x 12&quot; and accommodate 8.5 x 11&quot; letter size paper. Thanks for your question! Wave after wave, wave after wave, slowly drifting. This is what it feels like when you get this binder. It will hypnotize you so much that you'll start to sing the same lyrics to that one Today’s Hit song, over and over and over again. Wave after wave, wave after wave – see we’re hypnotized too! The awesome design of our wave binders will leave you wanting more and more. You might not pay attention in that meeting or that class if you carry this around, but just show it to your boss or professor, and they will totally forget about it – even after they ask you to stay after. Don't get a boring binder when you can get one that hypnotizes everyone! Our Wave 1 Inch Binders are wavy, shiny and fun! Wave 1 Inch Binders include 1 inside die-cut pocket to fit your business cards and CDs. Available in Pink, Green, Clear, Blue, & Purple. Wave after wave, wave after wa- Okay we're done.